A beautiful piece of Iron Man cover re-creation original art by legendary comic artist, Bob Layton! 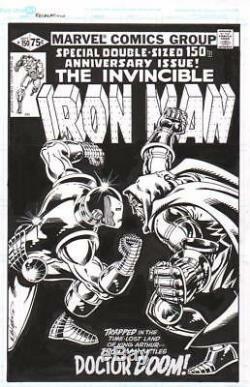 This is the original art to a cover re-creation of the famous Iron Man # 150 cover featuring Iron Man vs. Originally penciled by John Romita, Jr. This cover re-creation is of one of the most iconic Iron Man covers in the history of the Iron Man series! 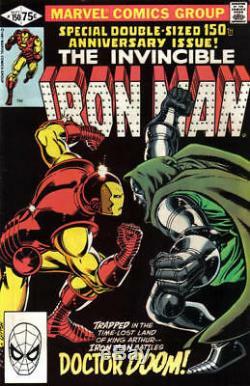 The art on this cover re-creation was penciled and inked by Bob Layton! Bob has signed the art on the left side of the cover, on Iron Man's leg. PLEASE NOTE: This is an original, hand drawn piece of Iron Man cover art, not a print, copy or facsimile! PLEASE NOTE: The corner box, text on bottom and Iron Man logo are photostats. Everything else is original art by Bob Layton! This 11 X 17 inch page of art on bristol board is in excellent condition and would make a great addition to any Iron Man, Dr. Doom or Bob Layton collection! It could also make a GREAT GIFT! These charges are the buyers responsibility. And, check out my other auctions for great original comic book art! Iron Man, Tony Stark, Dr. The item "BOB LAYTON IRON MAN 150 COVER RE-CREATION ORIGINAL ART! DOOM" is in sale since Tuesday, October 10, 2017. This item is in the category "Collectibles\Comics\Original Comic Art\Covers". The seller is "stevo861" and is located in Fort Lauderdale, Florida. This item can be shipped worldwide.